Hot Dogs are a timeless treat that go hand-in-hand with ball parks, sporting events, backyard BBQs, or 4th of July gatherings. So to accompany America’s favorite sports stadium treat, Gator Paper offers custom printed Hot Dogs Bags. 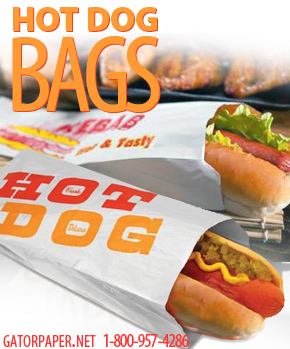 These bags are the perfect way to package your delicious hot dogs while locking in heat and flavor. The custom printed hot dog bags are made with a coated paper material to seal in heat and flavor keeping your hot dogs fresh and ready to serve well after packaging. Gator Paper is a top supplier of restaurant supply products. They have an excellent selection of quality made package supply products such as French fry scoop cups, clear plastic Pete cups, cushion foil, deli paper, butcher paper, handle shopping bags, custom printed hot dog bags, paper linen napkins, beverage napkins, to go boxes, placemats and much more. Anything you need to make your food packaging presentation a success, we’ve got it! Bags that are a timeless treat that go hand-in-hand with ball parks. These custom printed hot dog bags go great with any occasion. Whether serving hot dogs at a ball park, out of a food truck, street café, you are guaranteed to wow your customers with this creative packaging product. The custom printed hot dog bags are made with a specific material allowing us to print your custom logo or design right on the packaging. Our high color printing technology allows us to print on the bags with 3 color spot PMS printing. Send us your design and our talented printing team can discuss all your options. No one will forget your delicious hot dogs with brand marketing on this great packaging product.